The gap between supply and demand for agricultural products is steadily increasing. Genetic improvement of crops and livestock holds great potential for future productivity gains and is one of the key drivers of innovation in agricultural production. To meet the challenges of the future, research and development in breeding must encompass the entire spectrum from the characterization and use of genetic resources to the provision of sufficient amounts of premium agricultural products like food, feed, fuel and fiber. Synbreed is a unique network of excellent scientists from plant and animal breeding, molecular biology, bioinformatics and human medicine and aims at building an interdisciplinary centre for genome based research in plant and animal breeding. 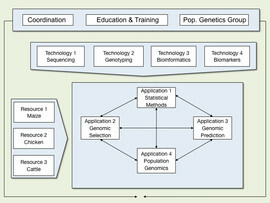 Utilizing advanced technologies such as next-generation-sequencing and high-throughput genotyping, Synbreed research is focused on the functional analysis of native biodiversity, the genetic analysis of complex traits as well as the development and implementation of optimal breeding strategies. In addition to a strong research focus Synbreed also has the objective to promote young talents and researchers. An interdisciplinary graduate program, scientific workshops and summer schools as well as international exchange provide attractive opportunities for the education of next generation breeders. Click here for more details on the sub-projects involved.